Make tutorial video easily with built-in recording tool. 20+ royalty free music at your choice. Edit audio separately by detaching it from video. With millions of videos that can be found online, your goal is to optimize your visibility. One thing that can help would be adding a YouTube channel description. In the rest of this post, we will tackle why it is important, and more importantly, how you can have it edited. Recommendation: The best video editor for YouTubers - Wondershare Filmora, not only allows you to cut, crop, rotate, reverse videos, but also offers your advanced features like PIP, Green Screen, or audio mixing. What's more, you can find lots of effects for Fashion, gaming, education, tutorial, sports, etc. Check this article to know more. If you have a YouTube channel and if you are not getting the number of views that you wish to have, there are possibly several problems. Maybe, your content is not enticing enough. Or maybe, it is because you do not have the right YouTube channel description. Generally speaking, the description of your channel will provide visitors of a snapshot of what the channel is all about. It appears in the about tab of your page. This is an elevator pitch, which will be an opportunity for you to show other people why they should watch your videos. Without a YouTube channel description, visitors won’t be aware of what you can offer. Take note of the fact that their attention span is minimal. They do not have the luxury of time to see each and every video in your channel. They will only click on it if they know that it is going to be valuable if there is any good that they can gain from such. This is where the importance of a well-crafted description enters the picture. 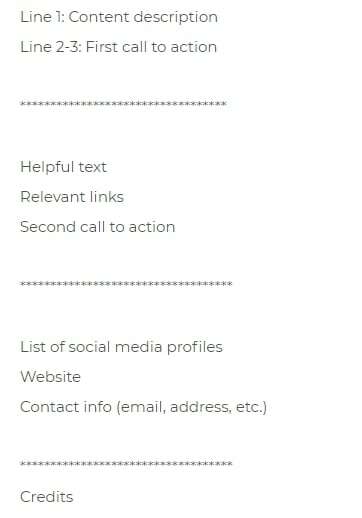 Here are some tips on how you can optimize your channel description. 1. Use the right keywords. Adding right keywords to your channel description will help to make sure that your YouTube channel will appear on the top of search engine results. Use keyword research tools that are available in order to determine which ones will add value to your description. And in your video description, you should add at least one core keywords to your channel description. 2. Advertise your programming schedule. By providing this information, visitors will know when exactly they can go back and check for latest updates from your channel. 3. Create a strong first impression. If you YouTube channel description are boring, chances are, visitors will no longer bother to view the contents. Create a powerful and enticing description that will trigger viewers to make a favorable action. 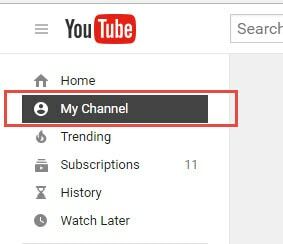 Activate the "Customize the layout of your channel" option by entering the Setting button on the right corner of your Subscribe icon. 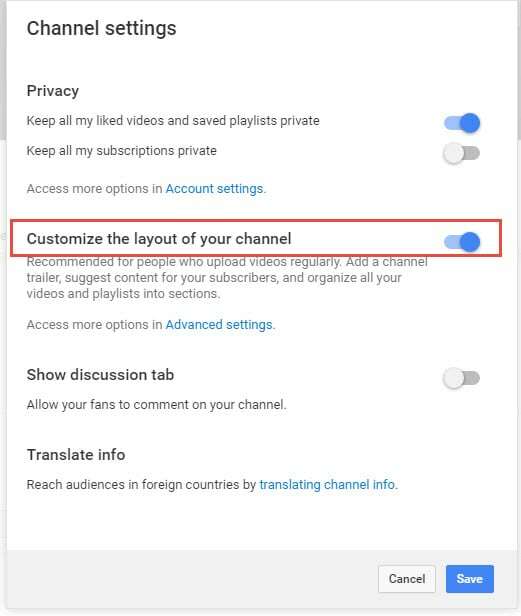 Note: In the newer YouTube version, click the option "CUSTOMIZE CHANNEL" and then you can change your channel description by clicking the About Tab. Write the description that you want to show up when people visit your YouTube channel. It is not enough that you write just any sentence. Make sure that it is sweet and simple. Be as concise and informative as possible. Use simple words, yet make sure that they are powerful and can stir the visitor to make a favorable action. Also, see to it that it makes use of the right keywords that are related to your channel. Click on "View as" which will allow the YouTube channel description to show up for New visitor or returning subscriber. 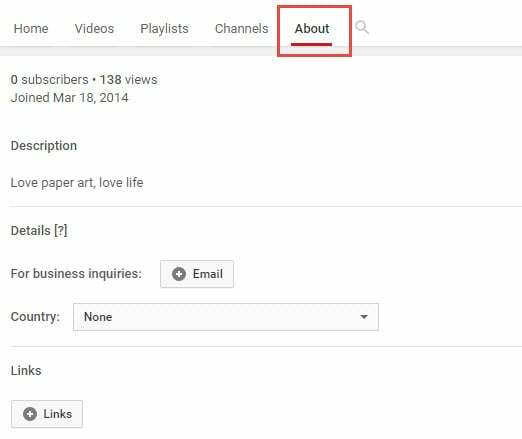 In sum, adding a YouTube channel description does not need to be a complicated process. Just follow the tips mentioned above and make sure to pay attention to crafting the right message. It must be keyword-optimized and must captivate attention of your visitors. 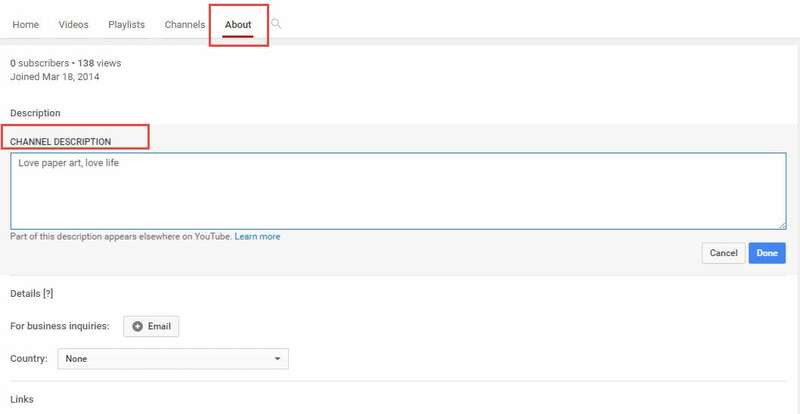 As the most important text in the YouTube video description, the text in the first line will appear both in the YouTube search result and the social media. It is recommended to write a short video description but for SEO purpose, keep in mind to contain the main keywords and write a clickbaity text. Besides the first line, Line 2 and Line 3 are also most visible in the video description. You can write a short explanation text for Line 1 or tell the audiences what to do next such as download the software or sub to your channel. It is highly recommended to add additional relevant content to the video description to help audience to get to know you better. You can add a brief summary of the video content or the transcript of the video here. Normally, you can add anything that is worth mentioning such as the equipment or software that you are using to make the video. My channel setting also hide.. How to recover that. Advanced settings only can see.. My channel customize is so trouble, options not available. Please help me..